We’ve all heard the saying that when one door closes, another one opens. But how do you find the open door? How do you find the opportunity in the challenge? Most importantly, how do you prevent the challenge from completely derailing your progress? At Fairview Health Services in Minnesota, they were able to do just that when a new merger led to a total system reorganization. A new set of teams, tools, skills, and cultures challenged the data governance efforts already underway. Rather than let the existing efforts fail, Fairview’s Betsy Keenan-Brown, VP of Clinical & Population Health Analytics, and other system leaders recognized that they needed to come together as a new, unified team to get a handle on the organization’s current state of analytics and be able to move forward in continuing their data governance work. Their approach to data governance focused on three important elements for finding opportunity and reassessing when faced with a new challenge. 1. Take time to understand where you’re starting and where you’re trying to go. Fairview first started with a current state assessment. They brought together the more than 100 leaders and team members to create a high-level value stream map using the software development lifecycle as a guide to aggregate all the processes and supporting mechanisms that come together to deliver their work. By outlining each of these steps, and including the perspective of each team member, they were able to not only define and document the processes, but also clearly see gaps and identify the areas where things weren’t working efficiently. Next, the team conducted a SWOT exercise, identifying strengths, weaknesses, opportunities and threats to really examine the internal and external factors impacting the team and their data governance efforts. The SWOT discussion allowed all team members to share what they think the future should look like and really focus on building that future together. Leadership is often able to describe what the ideal state is, but it was important to have all team members and the informal leaders who own the work giving input on what needed to change. This not only made for a more meaningful vision of the future, but it built trust and established a common set of expectations among the new team. 2. Don’t try to boil the ocean. Break out the work to help you prioritize. 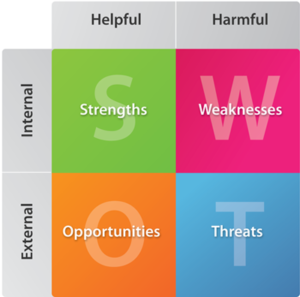 The SWOT exercise produced a list of key themes and opportunities for improvement. Rather than get overwhelmed with the amount of work that needed to be tackled, Fairview leaders were able to categorize the work to help prioritize what and when things needed to get done. Categorizing the work into quick wins, existing projects, and larger projects, ensured that progress was being made while also holding leaders and the team accountable for each of the identified improvement opportunities. Fairview leadership first identified the quick wins, which were important in getting momentum going among the team. The team was able to standardize their requirements documentation and create a subject matter expert registry very quickly. Next, there were several projects that had overlapping support and resources, which meant that they could be paired with existing projects. The report repository could be combined with the reporting catalog project, ensuring that efforts weren’t duplicated. Finally, there were the larger projects that would need ongoing support. It was important to call out that some of the projects would be ongoing and continually evolving. You’re never going to find the one, perfect tool for every data governance issue. Something new is always going to come along and it’s okay to recognize and be prepared for that. Showing a number of these larger initiatives that were in progress helped build recognition that improvement is both ongoing and continuous. 3. Remember that you’re not alone. Engage partners and experts to help you along the way. To learn more about Fairview’s journey, click here watch the webinar with Fairview’s Betsy Keenan-Brown and Prominence. If your team is ready to get started on your data governance journey, let’s talk.